Kolmen makuuhuoneen huvila, jossa on oma yksityinen aurinko lämmitetty uima-allas ja täysin ilmastoitu, joka sijaitsee 15 minuutin päässä lentokentältä San Agustinin ylellisellä alueella. Villa on vain lyhyen kävelymatkan päässä kaikista paikallisista mukavuudet, joihin kuuluu kolme supermarketit, ravintoloita, autonvuokraus, bussipysäkit ja taksipalvelut. Pieni lahti San Agustin on turvallinen ranta rauhallinen vedet ja saavutetaan kiertelevä päähän. San Agustin on enimmäkseen asuinalueita ja on siksi hiljaisempi kuin Playa Del Ingles ja Puerto Rico, antaen sinulle mahdollisuuden rentouttavaan ympäristöön, jossa voit viettää lomasi. Jos haluat hyödyntää yöelämästä Playa Del Ingles, Yumbo Centre ja Maspalomasin ne ovat vain 5 minuutin taksimatkan päässä. On oma kylpyhuone Master makuuhuone, joka koostuu kahden altaat, kaksinkertainen suihku ja wc. On lisäksi kylpyhuone iso suihku, wc ja pesuallas, joka on jaettu, ja siellä on toinen vaatehuone alakerrassa. Huomautuksia majoituksesta: Saapuessa Las Palmas lentokentällä voimme järjestää lentokenttäkuljetukset kuljettaja, joka vie sinut suoraan Villa. Täällä sinua odottaa meidän edustaja, joka antaa sinulle kaikki tarvittavat tiedot koskien loman. Hän myös antaa sinulle puhelinnumero, jossa voit päästä häntä jos sinulla on huolia lomallasi ja voi myös neuvoa sinua kaikista paikallisista palveluista. Klikkaa www-linkki alareunassa sivun kosketuspinta. Ulkopuolella: Allas on aurinko lämmittää kanssa vasta asennettu ympäristöystävällinen suolavettä. On myös täysin varustettu uima-kansi ja tämä mahdollistaa uima milloin tahansa vuodesta. Suuret terassit ovat varustettu aurinkotuoleja, lepotuolit ja ulkona ruokailutilat alla katettu terassi. Kodinhoitohuone: Sopii kuivaus alue pesu linjat edellyttäen ulkoterassilla. Puhdistus / pyyhkeet / liinavaatteet / siivouspalvelu: Pyyhkeet ja vuodevaatteet ovat säädetty sekä pyyhkeet rannalle ja aurinkotuolit ovat myös mukana. Allas on puhdistettava kahdesti viikossa ja siellä on lakanoiden ja pyyhkeiden kerran viikossa. Lisäksi puhdistus on saatavilla pyynnöstä. Muut: Edessä lounge on myös ilmastointi ja paljon suurempi, jossa voit istua mukavasti näkymä altaalle ja nauttia näkymä kukkuloille ja meren yli. Before arrival we had two concerns, the construction site next door and the proximity of the motorway. Fortunately, work on the building site is dormant, and the motorway is barely audible, especially with windows closed. The villa itself is very spacious and flexible, with many options for eating and sitting, both inside and out. Internal furnishings are tasteful and someone has put a lot of effort into the lovely garden. Our main disappointment was the pool, which was very cold indeed. We selected this property largely for the heated pool as we had toddler grandchildren that we wanted to teach to swim. This was not possible, but fortunately there is a heated 27°C pool nearby that we were able to use. On a more positive note, the BBQ is superb and there is an eye-watering selection of TV channels and DVDs, although we did experience some buffering on TV in the evenings. The villa had everything you could want for and more. Plenty of space both inside and out. The rooms were well equipped as was the kitchen. The pool was heated, but not as hot on cloudy days. There were 5 in our group and we all had our own space when needed but could all sit together in every part. Beverley was very helpful and accommodating. Definitely thinking of staying again, as one of the best villa’s we have stayed in. Highly recommended. We seem to have done it again ..... offered the right environment for a wonderful holiday and we thank you very much for not only taking the time to write but for your lovely recommendation. We would be more than happy to welcome you all again very soon. If you book to stay at Villa Escondida then you will not be disappointed with your choice. This hill side Villa is immaculately clean and decorated/furnished to a very high standard. There are so many extras that immediately make you feel at home, like the TV with Sky and a big selection of DVDs. There are plenty of kitchen utensils so cooking at the Villa is no problem should you wish not to go out for dinner but if you do there are plenty of restaurants nearby to dine out. Recently a brick barbecue and an outside kitchen area (complete with a sink) has been built for alfresco dining. The sea view from the living room, main bedroom balcony and the poolside patio is stunning. The location of the Villa could not be better. A fifteen minute walk from the Villa takes you to supermarkets and the beach. It is also near the GC1 main road which makes visiting other places on the island easy. On arrival at the Villa we were met by Beverley who is very friendly and welcoming. She explained how things worked around the Villa and is also a great source of local information. 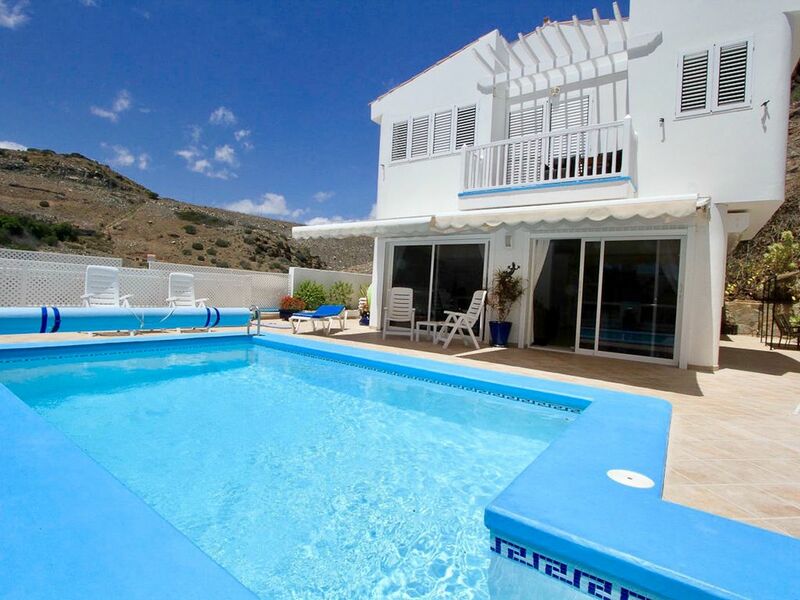 If my family return to Gran Canaria we would book this Villa again without a doubt. It exceeded our expectations and we would highly recommend staying at Villa Escondida. A great holiday was had by all. Wow I think we need to employ you as our PR lady! What a lovely review and thankyou for taking the time to give this testamonial. We are so glad that we were able to make your holiday stay all that it should be and look forward to welcoming you and your family back to Villa Escondida. This was among the best villas we have stayed in over the years. It was really well fitted out with plenty of the essentials including an impressive collection of CD's and DVD's (not that we needed to watch any DVD's). The pool, although not huge, was plenty big enough for our needs and lovely and warm from the solar heating. All in all, we had a really good holiday. What a lovely review thank you so much and we hope you will come and stay at Villa Escondida again. Your kind words are very much appreciated. Very comfortable and beautifully designed and furnished. Lovely quiet location. Lots of space inside and out. Great films to watch after days out. Love the view. Easy to get to the beach shop and buses. Thank you for your lovely comments and it is really re-assuring to know we are doing the right thing. We would really like see you again in the not too distant future. I rented this property in April 17 as a quiet retreat for the family (children 7 & 10) and it didn't disappoint. From the smooth transfer arranged by the owner to the return back to the airport at the end of the week, everything was perfect. Bev met us on arrival at the villa to explain everything and she was so lovely and helpful. The pool is cleaned during the week and loads of towels are available for use (both beach and 'nice' ones). We covered the pool every night and this kept the temperature at a nice even 30 degrees 🤗� The sky plus was an added bonus and there are lots of dvds to choose from if you fancied a movie night. Decor-wise, it was like living in one of the ikea showrooms; it made me want to redesign my own home! We made use of the free bus to visit the crocodile park and had a fantastic time. It left at 10:35 from the shopping centre in San Agustin and retuned to the park at 2pm for the return journey. Price of entry was very reasonable (around 35 euros for a family of four) and food in the restaurant was very good. The only negative was that we wanted to stay longer but couldn't because we had to catch the bus back! The local shop is a 10 minute walk away and there is even a shopping trolley in the villa so you don't have to carry the heavy water (and wine) back up the hill. The beach is just over the road from the shop but to be honest we didn't bother going as the villa had everything we needed. We took a taxi to nearby Playa del Ingles which was about a 15 minute ride but only cost 6 euros (each way). That has a McDonalds for anyone interested 🍔� (I blame the kids). I really can't praise the villa enough. If you are looking for a nice quiet location and a place that feels like home from home, then look no further. I discovered that there are not many reviews because the people who go return year after year. Perhaps its like a best kept secret - very wise! I will break the silence and share how wonderful it is. Hopefully there will still be a week free for us to return! Wow ... what a lovely review thank you. I think we need to take you on as a marketing director ... when are you free? Lähin ranta on 10 minuutin kävelymatkan päähän, josta löydät suojaisan lahden San Agustin. On kaunis rantakatu, joka vie sinut suoraan Playa del Inglesin ja Maspalomasin, mutta jos haluat pysyä lahti on ihana rantaravintola palvelemaan kaikkiin tarpeisiin. Las Palmas lentokentälle on 15 minuutin ajomatka. On monia kaupunkeja hieman kauempana rannikkoa pitkin tien ja nämä tarjoavat tilat jokaiseen makuun. Jos olet vuokraamalla auton on ihania kyliä ja vuoristoja tutkia, jossa voit kokea enemmän alkuperäisiä osia Gran Canarialla. Paikallinen supermarket on 5 minuutin kävelymatkan päässä ja siellä on 2/3 paikallisia ravintoloita, autonvuokraus toimisto, (vaikka tämä ei ole välttämätöntä) kampaajat ja pieni sairaala että palvelut tämän saaren. On aina takseja sairaalan ulkopuolella ja on tärkein linja rantatien sinut kumpaankin suuntaan saaren. Booking Notes: The cost of the villa per week averages £1300 for up to 6 people and dependant on the season or late availability this will be reduced. The total airport transfer for up to 4 people is 68 Euros and for 6 people 115 Euros and of course this is subject to change but we can always offer a quotation first. Naturally after confirming availability we would ask that a 25% deposit is sent to secure the booking and the balance is paid no later than 8 weeks prior to travelling. Changeover Day: Our preferred changeover day is Monday but we can sometimes be flexible and would ask that you contact us to enquire if we can fit in to your arrangements. Notes on Prices: Any public and half term holidays will be charged at £1300 pow, Easter is £1,450 pw and Christmas/New Year are £1600, (2 week reservation preferred for this period). Prices shown are for the property per week in UK Pounds and any other currencies will be calculated based on the exchange rate at the time of your booking.